Thor SMETTE is happy to announce that Mr. Björn STAM became a partner in ZINGA Sweden AB. Björn is 49 years of age and has been active in sales and consulting of paint and equipment for anti-corrosion painting since 1991. Good knowledge of NORSOK M-501 design and documentation. Surface finisher in the wood industry 1984-1990. Björn has a Frosio Level 3 Certificate since 2011. Björn and Thor have been working very close for the last 2 years and he has also learned a lot from Rick Simpson. https://www.prochroma.se/ A paint and paint equipment supplier represented in 4 different areas in Sweden. ProChroma will continue to be a retailer of the ZINGA products. http://www.stcontrol.se/ A professional paint / corrosion inspector company with 3 Frosio Level 3 inspectors, and where Björn is one of the inspectors. Björn has just finished his first ZINGA bridge project in Sweden where 2 x 90 my ZINGA was used. The result of this project is very good, and the Road Authorities are very happy with both the performance of the team and the cathodic protection. We are very pleased to announce that Ms. Shei SIMPSON has joined the ZINGAMETALL Team in Eke, Belgium, since 4 December. Shei is the 27-years old daughter of Rick SIMPSON. Shei became a qualified coating inspector at the age of 21. Shei also followed and succeeded in several professional courses. To name only a few : SSPC Level 1 Coating Inspector, Rope Access Level 1, Level 1 Blasting & Spraying, Offshore Sea Survival test, BOSIET, MIST. Shei will reinforce and help our Tech Team as a R&D Assistant. And after an intensive training at ZINGAMETALL she will step into her father’s feet as a Corrosion Consultant for assisting and helping our distributors and clients on the field whenever required. A very warm welcome to you Shei and we wish you a very long, interesting and fruitful career. The entire ZINGAMETALL Belgium Team. If you click on this link: http://720yun.com/t/71ej5phkvn0?from=singlemessage&isappinstalled=0&pano_id=7617273 you will be redirected to an aerial footage taken from a drone on 13 November 2017 at the Guangdong Lufeng Jiahuwan Power Plant. Only roughly half of the steel structures of the multi-story main plant and boiler buildings (to the right of the tall square concrete tower) plus some surrounding small structures that are most visible in grey are coated with ZINGA. The total quantity used up till now only about 250 tons of ZINGA so far. The other half are hot-dipped. The buildings or structures surrounded with green tarp are mostly concrete with very little steelworks, which are also hot-dipped. Miscellaneous smaller structures and steelworks supporting all kinds of equipment are still being fabricated and have yet to be installed. This may consume another 30-40 tons of ZINGA over the next 9-10 months. The project is already falling behind schedule, for over 1 year, due to multiple delays in the steel fabrication itself, but also to defective surface preparation and coating application by the steel fabricators. Now, 18 months after the project began, ZINGA has by comparison proven to outperform HDG (Hot-Dip Galv.) and the project leaders have realised they should have kept more steelwork for ZINGA and less for HDG. It is our goal to recapture more ZINGA business for Phase 2 which will not commence until December 2018. Upon completion in 4 phases and fully operational in 2024, the Guangdong Lufeng Jiahuwan Power Plant (8 x 1000 MW) will be the world’s largest and cleanest coal-fired power plant, serving Guangdong, the richest Chinese province which has a total population (highest nation-wide) of over 104 million people and contributes to more than 27% of China’s total GDP. The project is very highly regarded and blessed by the Central Government of China and the Guangdong provincial government, as it will be China’s first and largest clean new energy power plant, with zero emission of pollutants – achieved by adopting the most advanced and high efficiency German technologies in reduction of carbon emissions, desulphuration, denitration, water & energy conservation in generating coal-fired power. Sea water will be desalinated and used for cooling the boilers and generators in the conversion of heat to electricity. Waste water from the power production areas and the workers’ living quarters will be treated and recycled for landscape irrigation and non-potable use. Construction and operation of the Lufeng Jiahuwan Power Plant will conform to the highest standards and levels of occupational health & safety, environmental protection, ecological balance optimisation and operating cost effectiveness. Total capital invested by Guangdong Baolihua New Energy Stock Co., Ltd., which is listed in the Shenzhen Stock Exchange, is in excess of RMB 36 billion (or EUR 5.37 billion). The 8 x 1000 MW electricity produced here will be fed directly into the Guangdong Power Grid, one of the 5 state-owned national power grids in China, for consumption in the surrounding regions of southern China. The massive site occupies a land area measuring 2.2 km and 1.6 km right at the seaside facing the South China Sea. Small sections of the plant will be built on reclaimed land and a privately owned pier (equipped with an extensive, steel structured, fully automated coal conveyor system) accommodating up to 100,000 tons of vessels carrying high-grade and combustion-efficient coal imported from Australia and Indonesia will be built along the shore line parallel to the power plant. Geographically, this locale, with an atmospheric temperature range of 3~40°C, receives very heavy rainfalls and multiple typhoons annually. It is a frequent landing pad of many typhoons originating in the Philippines. When fully operational by late 2024, the Guangdong Lufeng Jiahuwan Power Plant will employ more than 1,200 full-time workers and staff, providing them with well and truly self-containing facilities for working, living (with a huge hotel-like fully serviced dormitory accommodating up to 800 employees), relaxation and entertainment. This, and another gigantic resort-looking office complex with 2 enormous canteens serving 1,200 people daily (working in 3 shifts) have already been built and are in ready-to-move-in conditions. Total quantities of steelworks used are about 45,000 tons per phase of construction and 220,000 tons in total. The quantity of Zinga needed for anti-corrosion protection of major steelworks is approximately 300 tons per phase, based on 150-180 µm DFT applied as a unique stand-alone system. 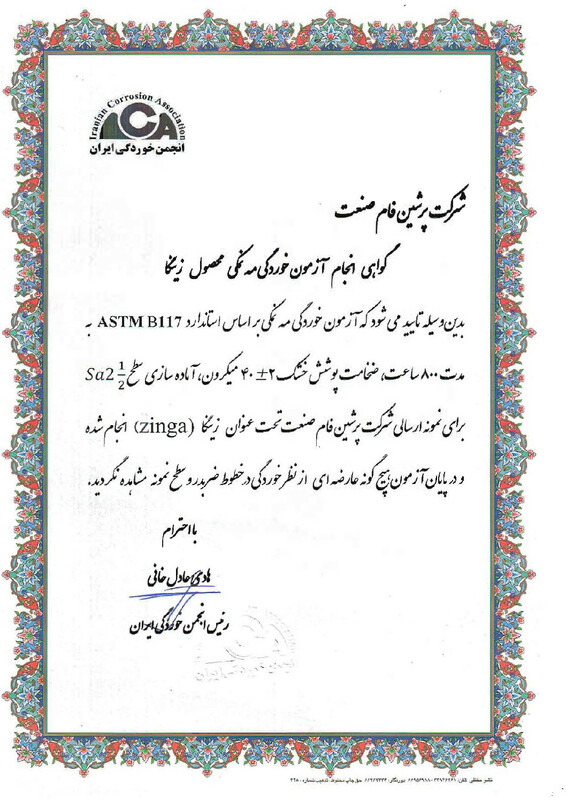 We would like to congratulate our Iranian Distributor Persian Fam Industry Co. Ltd. for sharing this report with us which he obtained in order to be able to better promote ZINGA in Iran. Persian Fam Industry Co. Ltd. It is hereby certified that a Zinga® coated plate with a DFT of 40 ± 2 microns passed 800 hrs Salt Spray test without any rust or failure in cross cut area or other coated parts parts according to ASTM B177. It should be mentioned that the plate was prepared to Sa2.5 before coating application and Zinga® sample was provided by Persian Fam Industry Co. Ltd. Recently one of our ZINGA Distributors organised together with Zingametall Belgium an event in Asia. 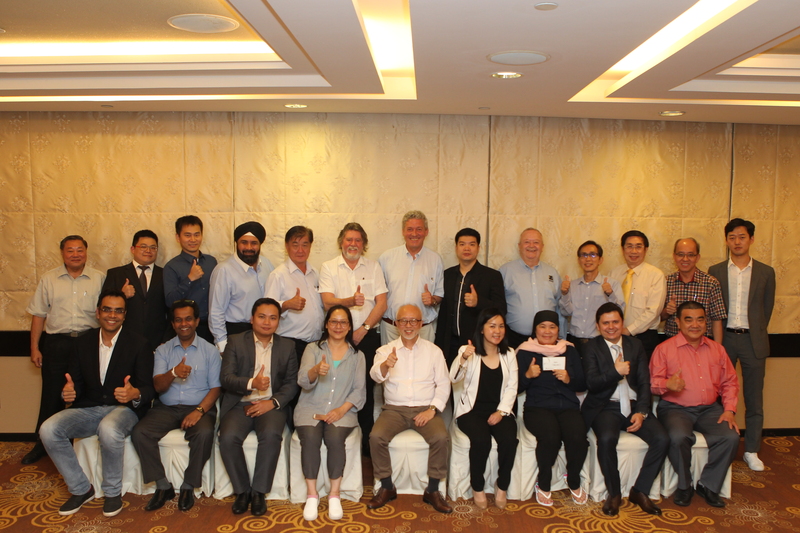 We would like to thank Zingametall Singapore and its crew for the successful ZINGA ASIA-PACIFIC gathering & seminar in Singapore we had together with our other ZINGA distributors from Australia, Brunei, China, India, Indonesia, Malaysia, South Korea, Thailand, Sri Lanka and Singapore. For the past 2 weeks we had a problem with our system regarding our contact system via the site. This has now been rectified and solved. Our appologies for anyone who requested MSDS sheets, general information,… but we did not recieve your requests. If you could resend your requests we will get to them ASAP. It is important to carefully position ZINGA in the broad spectrum of protective coatings. To give decision makers the vital background information needed, information on ZINGA is published in professional literature on a regular basis in different countries all over the world. The protection of steel using different surface coatings has been a practice ever since steel was more commonly used as construction material in the world. Analysts believe that protective coats today represent sales of over nine billion US dollars per year and that this figure will have increased to fifteen billion within less than 5 years. Where there is steel, there is corrosion and also the corrosion-related spending has risen to billions. Indeed, countries like the United States, Britain, Germany and other industrialized countries have an individual corrosion related expenditure of more than ten billion US dollars. 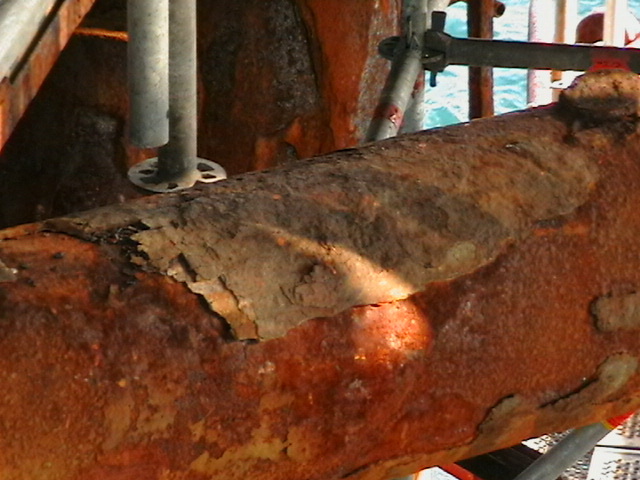 This means that the cost of corrosion is significantly higher than the sums spent on industrial coatings worldwide. A common method to protect steel from attack by corrosion is to coat the structure with different types of paints. One part contains anticorrosive pigments and additives, others react with surface humidity leading to changes in the paint film by which a protective barrier is formed to block the contact between the air / oxygen and the metal surface. Many of these systems are very effective, but if they show bubbles, cracks or other defects in the coating, for example, due to damage during labor and / or transport and construction, the barrier will be broken and the effect will be lost. In coastal climates, a completely intact coating that has been applied too thin (for example, at the edges not rounded correctly) may allow chloride ions on the surface to penetrate the paint film to the steel surface underneath. It is therefore very important that the paint specifications are followed to the letter, otherwise errors may occur. It usually costs four to five times more to correct the errors than the original cost was, because of all the extra work afterwards. The above is one of the driving forces of the global use of hot dip galvanizing to protect steel since many decades. Hot dip galvanizing eliminates many troubles that may occur with surface treatment in the form of paint application. Having said this, it is understood that also hot dip galvanizing has its own parameters that must be followed to achieve a good result. Tubular closed details must for example be provided with a vent hole per meter with 25 mm diameter, to avoid that the details explode when heated. Among architects, it was of course unpopular to drill holes in carefully designed structures, and to fill them was a laborious and expensive process. Kalvoya bridge in Oslo was treated with ZINGA film galvanizing system almost 30 years ago. Another concern is the risk of twisting of thin steel parts. Even a very small rotation means, for example for a long I-balk that the bolt holes no longer match the holes on the second beams. It also occurs that some steel alloys have a different surface structure than ordinary steel and this can be a problem for hot dip galvanizing. Thus it can be difficult to achieve a uniform design of a welded construction composed of several different steel types. Some metals, such as cast iron are difficult to hot dip, and cannot be dipped in a liquid zinc bath with temperature at 450 degrees, because this would lead to bursts. During the early 1970’s, a system for film galvanizing called ZINGA was developed in Belgium. 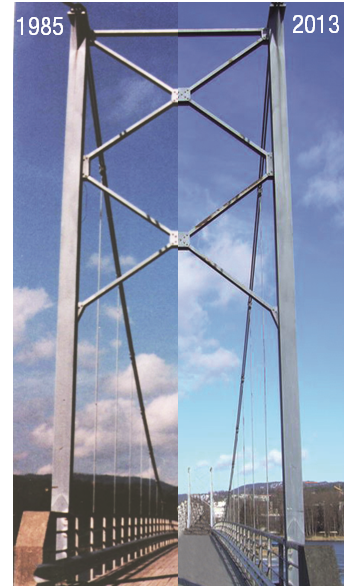 ZINGA can be used as touch up for structures that cannot be removed and were previously treated by hot dip, such as high-voltage masts, bridges and traffic sign posts. Film galvanizing system with ZINGA offers the same type of cathodic protection as hot dip, but it is applied in the same manner as a paint system. The liquid galvanization consists of atomized zinc particles, resins and binders. The method quickly proved to work well for repairs and could restore or increase the zinc coating thickness. The good results with these kinds of repairs convinced more and more manufacturers to also use this method, among other things, in order to eliminate the problems with rotation of thin steel parts. Even iron could now be galvanized, if the application takes place at ambient temperature. FILM GALVANISING combines cathodic / galvanic and barrier protection. Application can be done by brush, roller or spraying. Zinc content in the dry layer is at least 96%. It can be applied in a humidity up to 95% (avoid water droplets on the ground) and in temperatures down to minus 15 degrees Celsius. The zinc coating dries at ten to fifteen minutes and a second layer can be applied after an hour. Due to these properties, film galvanizing is greatly used in the offshore sector and in applications on foundations of ports and bridges. ZINGA can be painted for aesthetic reasons if desired, but it does not require any extra finishing coating. A nice example of the longtime performance of the surface is the Kalvoya bridge, outside Oslo. It was treated with ZINGA nearly 30 years ago and it is only now that a further refurbishment is being considered. Moreover, it has been found that a new blasting will not be required before applying a new zinc coating, it will be sufficient to clean the surface to be treated under high pressure (700 bar). Tensile tests have demonstrated that the now almost 30 year old ZINGA layer still has an adhesion of 11 MPa. This experience clearly demonstrates that it is possible to keep virtually all types of steel and iron constructions maintenance-free for a large number of years, giving them a full cathodic protection, provided they are properly cleaned and sandblasted, namely: with ZINGA film galvanizing system. It has also been shown that a new blast is not always necessary when, after a few decades it is time to renew the coating with more zinc, says Thor Smette, CEO of Zinga Sweden AB. After a thorough rebranding, Zingametall enters its final step of transformation: a new website. The website contains a lot more information than the previous one, conveniently organised according topic.